When I started planning for my first solo trip, I turned my nose up at guidebooks. Why bother paying for information that I can easily get online? Though I refused to shell out Php 1,000 for a Lonely Planet Thailand, I ended up buying an AAA Spiral Thailand and a Traveler’s Companion Thailand that ended up costing me as much (maybe even more) than the LP guidebook. In the course of preparing for the trip, I came to the conclusion that toting a guidebook means you have information within reach — no need to go online to find out where to eat. It was Lonely Planet’s size (and the tag price) that turned me off from buying it. I wouldn’t want to be toting a heavy book around. That’s how I ended up shelling with the spiral guide; it’s small and light enough that it doesn’t add any significant weight to my bag. I hardly used it. While the BTS, MRT and river ferry station map inside the book was useful, the rest of the book didn’t help me much. The next guidebooks I bought were the Lonely Planet Philippines and Jens Peter’s Philippines Travel Guide. I think I used the LP Philippines once on a trip in 2008, and the Philippine Travel Guide as resource material for another trip. Then it promptly got lost in the black hole otherwise known as my room. In 2009, I tried it again. I bought Southeast Asia on a shoestring, in preparation for my month-long Southeast Asian backpacking trip. It was part of an effort to stop spending too much time online; I figured having something to read offline would help me with both the trip planing and keeping up with the resolution. Though I relied on the book for research, I only brought it up to Singapore — it waited for me in my brother’s flat while I went around Cambodia, Thailand, Laos and Malaysia. While preparing for the trip to Myanmar, I decided to buy a guidebook and bring it with me. I figured with the limited Internet access, it would do to have a guide with me. Considering that I hardly made any research about the country formerly known as Burma, I relied heavily on the guidebook. I stayed in places listed under the sleeping section, ate at the recommended restaurants and wandered around with the map. During the long boat ride from Mandalay to Bagan, I turned to the book to pass the time in between daydreaming and playing Angry Birds. After the long and winding talk about my history with guidebooks, let’s go back to the question: should you buy a guidebook or not? What I love about guidebooks is that it’s right there. No need for a computer, Internet or electricity. What I dislike about it is the obvious bulk and weight it adds to your bags. When you’re backpacking, the weight of each item you pack matters. Unless of course, you’re a sucker for punishment and relish walking around toting a 20 kilo backpack. Guidebooks, though thoroughly researched, will always recommend places that have already closed or has changed rates. Months pass from time of research to time of publication, that by the time the book reach the shelves, it’s already out of date. With the coming of smartphones and tablets, guidebooks are making its way to our gadgets. Lonely Planet offers almost all of their guidebooks in electronic format. Publishing this way is not only more eco-friendly, it can also be deployed much faster than the actual book. You also have the option to just buy certain chapters of the guidebook. Of course, while having the e-copy of the guidebook in your device saves you a lot of space and added weight, it’s stored in an electronic device. If your device runs out of juice, your guidebook is useless. On the other hand, not having a guidebook gives you the freedom to wander on your own and make your own discoveries. It also gives you a reason to interact with the locals, which almost always unforgettable encounters. So what’s the answer to the question? Yes… and no. Guidebooks are just that: guides. They’re not rules that you have to follow to the letter. They’re great resources when you’re planning a trip, and a good thing to have when you suddenly find yourself without anything to do. Why not give the guidebook a spin and see if you’re meant to be travel buddies? 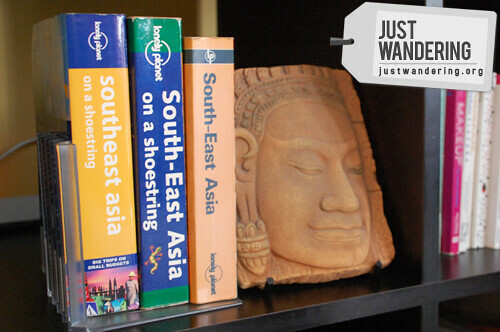 I’m giving away a Southeast Asia on a shoestring guide book along with other must-have travel items. Click here to learn more about the Just Wandering travel essentials giveaway. “On the other hand, not having a guidebook gives you the freedom to wander on your own and make your own discoveries. It also gives you a reason to interact with the locals, which almost always unforgettable encounters.” -indeed! Yeah, I switched plugins, and it’s not pulling in images from flickr. Too lazy to find a fix pa.
Pls. do share. Philippines edition. Sure! I can e-mail it to you. hey nico, can you send it to me too? Hi! Can you send me the e-book? thanks much! Can you send the PDF files to gimikera [at] gmail.com It would mean a lot to me. Prior to a trip, I usually compile all my research from the Net into a Word file. I then print out out the Word file and send a copy to my email so I can access the links when I need to refer to the original source. I usually organize my research according to my itinerary so I can quickly find the info I need. Through this method, I just need a few sheets of papers and not a whole book to carry during the trip. It also helps jog my memory after the trip and I can add notes to my printout if I find that the data I got from the Internet was wrong. I remember one of the most practical things I ever carried while traveling was a map book of the city and country I was staying in. I love maps! What I do is I ask the reception of the hotel or hostel I’m staying at for a map and ask for directions. They’d mark the places on the map, which makes it all the more easier to wander around! i love LP guidebooks — as much as i can, i try to buy the updated version of a city or country i visit all the time. although the info is really useful, for me it’s more of a security blanket — i enjoy walking around getting lost in a foreign city, knowing that the things i need to get back out on the straight and narrow is sitting inside my tote. I have not used a paperback guidebook in years. Bought some off the internet a while ago, however downloaded them in PDF and I was still not impressed with them as I found the information to be wrong. Their recommendations of hotels as well lead me to believe that the recommendations were in fact adverts and this was not declared. But then again there are questions that can’t be answered by the internet, that can be found on the pages of Lonely Planet. And planning takes away the fun in spontaneous travel. I want that Lonely Planet book!!! A combination of both guidebook and going it alone , lol.The books are out of date regarding accommodation,places to eat and pricing by the time you purchase or download them. But they are ideal for giving background regarding your destination . I’ve always wanted to buy my own copy of LP books but been delaying for a long time. On a recent trip to Guimaras, I didn’t know what came over me that I didn’t bother researching on where we needed to go since I thought it was easy to find our way around town. ‘Twas a good thing LakbayDiva brought his LP book and we were saved. Like Micamyx I don’t rely on travel books when I plan my trips. I usually check travel blogs (especially this blog :)) for travel tips. For me I can rely or trust local travel bloggers 100%. Guidebooks are fine and they still have a place in a traveler’s backpack. As you said, it’s always there with you when you need it, and you no longer have to go online to get information. You can then expand your research with the help of fellow travelers through their blogs, or discussion forums. And personally, I still prefer reading text on paper.